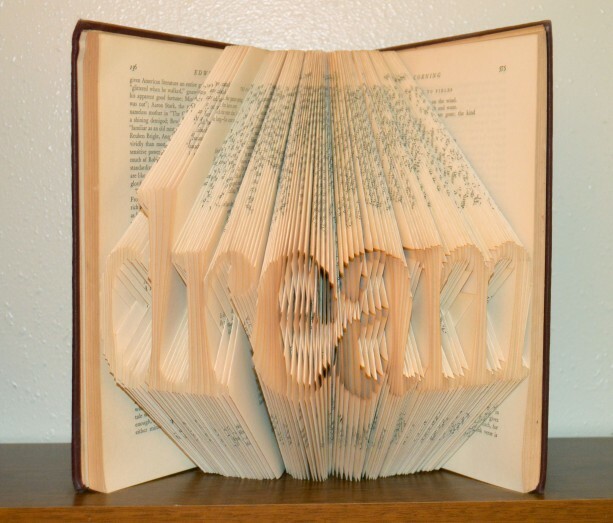 This listing is for a custom-made folded book that will say "dream". The photo shows an example, your book may vary in color and size, but most of the books are about 6"x8" books that will be about 10"x8" while open on display. The pages are simply folded, not cut or glued. All the books I choose for folding are books that are not rare & valuable, but they are typically from before the 60s, so there may be a bit of wear and tear. I believe that simply adds to the authentic charm! * * * * * * * * * * * * * * * * * * * * Your book will have the same word as the one shown in the picture, but it will be a different book than the one shown. If you'd like a custom order with a different word, please contact me! * * * * * * * * * * * * * * * * * * * Books are created in a smoke-free (but not cat-free) home. They are gently closed (they will not close all the way due to the folded pages' bulk) and wrapped with tissue before shipping. When you receive your book, simply unwrap and open the book, letting it sit on the shelf in an open position, and the pages will "relax" and come to a naturally open state. Thank you for your interest, I look forward to working with you!